Tours are made available for the public and private parties. 505 W. Oklahoma Ave, Guthrie Ok. The LTRS is an old warehouse that dates back to the late 1800s. It has been the final stop for our Train Depot Tour the last couple of years. There has been paranormal activity reported there for many years. The activity reported ranges from strange noises to full body apparitions. PROS has been conducting long term research at this site for many years. We are aware of the activity that happens around our team members that are present week after week. We have noticed at times during our public investigations with new people at the site there has been a change in the activity. We want to start recording this activity and comparing it to our regular investigations. Join Pros for a live investigation of the Long Term Research Site. Be part of the PROS LTRS 2010 Research Project. We will start the evening with a seminar covering the theories and techniques used in paranormal investigating. The tools and equipment we use will also be on display for you to see and inspect. After the seminar and a Q&A session, the guests will take part in a serious research investigation. Come and learn what a real paranormal investigation consists of and be part of our research. Any evidence collected will be made available to our guests to keep along with a certificate of participation in the PROS LTRS 2009 Research Project. *Ages 10-12, no children under 10 years of age. PROS Investigations is a non-profit organization. PROS members receive no compensation of any kind for their services. 100% of all public investigation proceeds are applied to the expenses and upkeep of the site and equipment. 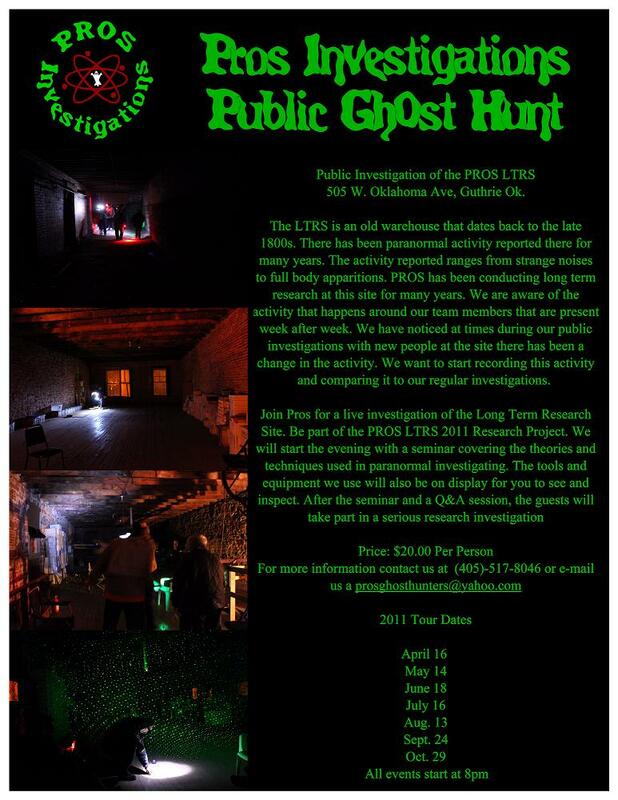 Limited availability, all spots for the investigations are on a first come first serve basis. Reserve your place now by clicking below and prepaying. If for any reason you cannot make the investigation after prepaying, contact us within 24 hours of the start of the investigation and we will refund your money. The above EVP was captured at our Ghost Tour on May the 16th of 2008 at our research site. Tony is heard talking and a ball that rattles is heard rolling across the floor. The ball stops rolling then a male voice is then heard saying. "You there."